Baking is not my strong point. I have made several pound cakes that never want to leave the pan, and come out looking like a hot mess. They always taste delicious and that somehow makes up for the lack of presentation! 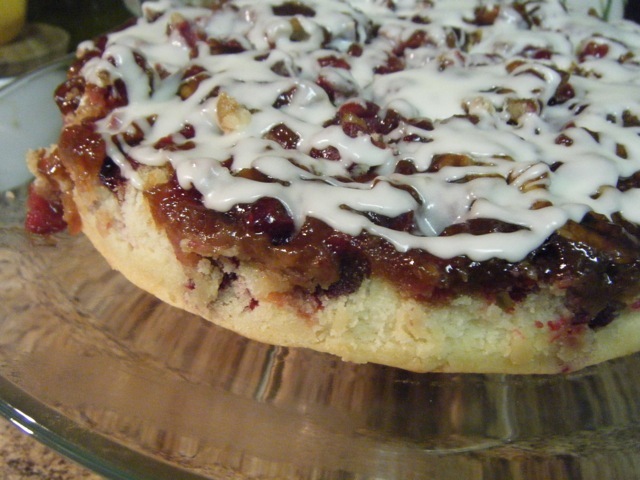 I came across this recipe on Pinterest and thought it would be a perfect dessert to bring to our families Thanksgiving feast! This cake is also going to be a nice change to the usual pumpkin pie we are used to having. While typing out this recipe, I realized, I forgot the damn cinnamon. So mad! Maybe I will sprinkle a pinch over the top before serving it tomorrow. I was so close to having a near perfect baking experience. Oh well, I guess there is always the Christmas dinner for round #2. My other oops moment happened after I put the cake in the oven. The vanilla extract walked in front of my arm and knocked itself over. But at least this had nothing to do with the cake that was behaving in the oven! Spray a 9-inch round/square cake pan with cooking spray. Sprinkle and shake 1 tablespoon on flour to evenly coat the pan. 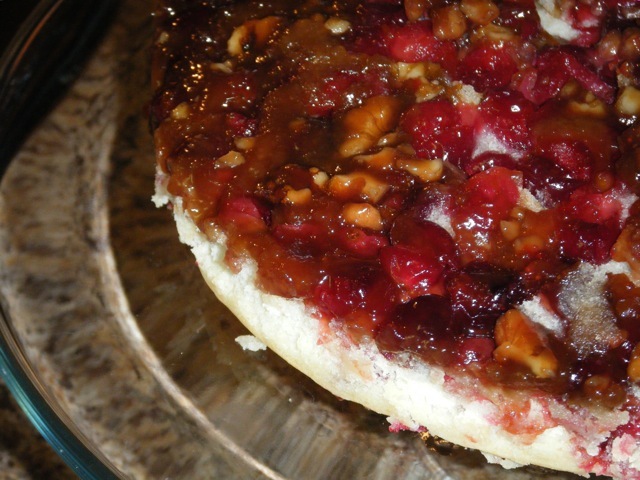 Mix together cranberries, walnuts, and orange zest in a bowl. In a small sauce pan over medium heat, melt 2 tablespoons of butter. Then add the brown sugar, 2 tablespoons of orange juice, and cinnamon (can’t believe I forgot the cinnamon!!). Let it cook for 3 minutes, stirring constantly. 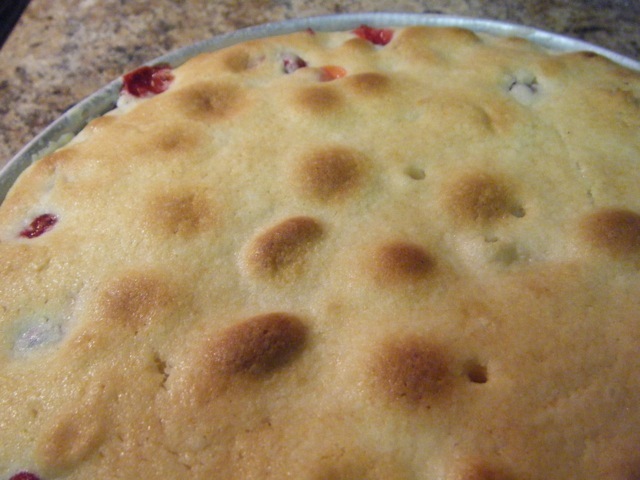 Pour the mixture into the cake pan and sprinkle the cranberry mix on top. In another bowl, stir together flour, baking powder, and salt. Using an electric mixer, beat together 6 tablespoons of softened butter and sugar at medium speed. Then add the vanilla extract and egg. Once combined, reduce the speed to low and alternate adding the dry flour mix and butter milk (Start with the dry and end with the dry). Add the batter to the cake pan with a spatula and carefully spread out until it is an even layer. Bake at 350°F for 30-40 minutes…use the toothpick trick your momma taught you! Cool in the pan on a wire rack for 10 minutes. Run a knife around the edges, then carefully flip the cake onto a plate or cake stand. Cool completely before adding the glaze. For the glaze, mix sugar, melted butter and orange juice in a small bowl, stir until smooth, and immediately drizzle over cake. Or, make the glaze before serving and drizzle it then. Here you will find recipes, projects, thoughts, restaurant reviews, product reviews, thoughts about life, travels, family, parenting, and whatever This Carolina Girl wants basically!